We have often seen in other specimens how Jan's good taste and sensitivity led him to select simple and small examples of the best of each mineral. This is one of the best examples of his style. 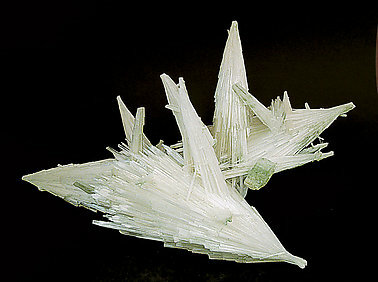 The radial bundles of Scolecite compete with each other to show off their beauty. The central crystal of Fluorapophyllite-(K), suspended on a bundle of Scolecite as if by magic, is the final touch to this work of art.